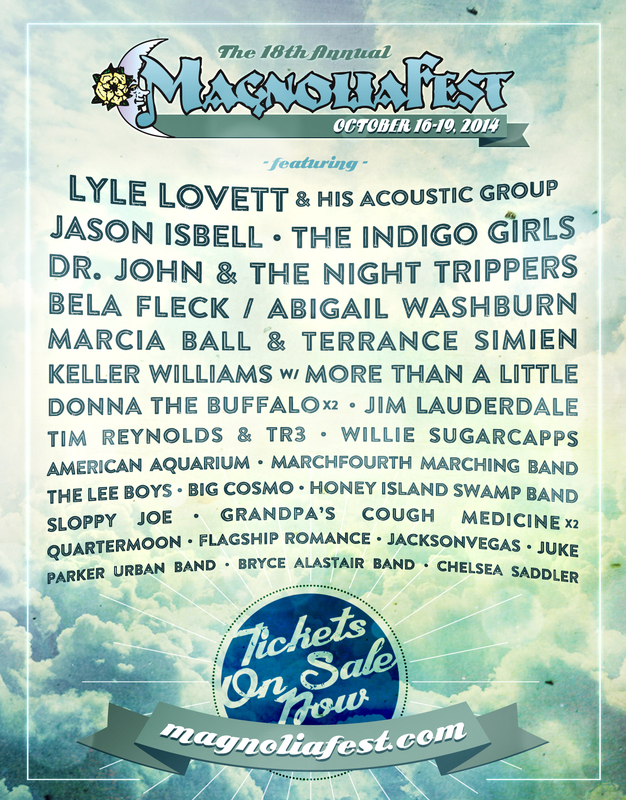 Magnolia Fest celebrates its 18th year at the magnificent Spirit of the Suwannee Music Park in Live Oak, FL on October 16-19, 2014. Festivalgoers can enjoy four days of camping and live music, arts and crafts, and a selection of great foods. Magnolia Fest consistently features some of the world’s finest performers in Americana, Roots Rock, Acoustic Blues, Singer/Songwriter, Bluegrass & Newgrass, Cajun/Zydeco, New & Traditional Folk and other forms of American Roots music. Tickets are on sale in advance and at the gate. Magnolia Fest is excited to welcome to the 2014 stages Lyle Lovett & His Acoustic Group, Jason Isbell, The Indigo Girls, Dr. John and The Night Trippers, Bela Fleck & Abigail Washburn, Marcia Ball & Terrance Simien “Boogie on the Bayou”, Keller Williams with More Than A Little, Donna the Buffalo, Jim Lauderdale, Tim Reynolds & TR3, Willie Sugarcapps, American Aquarium, MarchFourth Marching Band, The Lee Boys, Big Cosmo, Honey Island Swamp Band, Grandpa’s Cough Medicine, and many more. This energetic and family friendly musical celebration is a gem of a festival with a great lineup, beautiful fall weather and a stunning natural setting. There will be a kid’s parade on Saturday at 11am. The Live Oak Music And Arts Foundation (LOMAF) will have a booth with raffles to raise money for the local music and art programs in the area. Tickets $150 adv until 6/20; $170 until 8/22; $185 until 10/15 / $200 at gate/ Kids under 12 are free. VIP Ticket $300: Includes dinner, discounts, VIP Lounge, a festival poster, etc. RV sites , cabin rentals, and golf cart rentals are also available, call 386-364-1683 to reserve. Spirit of the Suwannee Music Park, located just north of Live Oak, FL,is a one-of-a-kind music park and premier 500+ acre campground nestled on the shady banks of the historic, tea-colored Suwannee River in North Florida. SOSMP hosts a variety of events throughout the year including Wannee, Magnolia Fest, Suwannee Springfest, Bear Creek Music and Arts Festival, Hulaween, Aura Music Festival, The Purple Hatters Ball, The Zach Deputy Disc Jam and more. In addition to these events, the park offers live music during the week in the Music Hall and a natural amphitheater for outdoor music festivals.